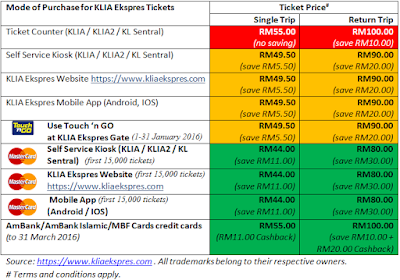 Effective 1 January 2016, the ticket price for KLIA Ekspres train operated by ERL Sdn. Bhd. 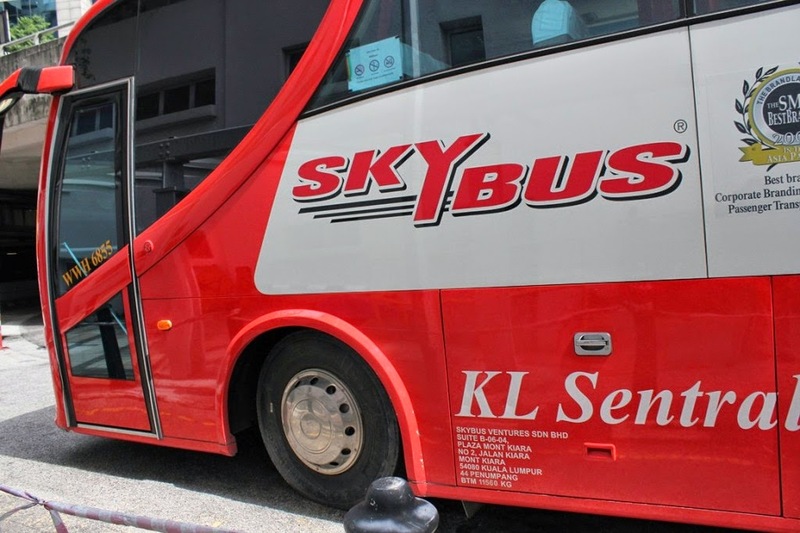 has increased from RM35.00 to RM55.00 for a single trip. However, as a smart customer, you should take advantage of a number of special discounts offered when you buy ERL's KLIA Express train tickets. If you buy KLIA Ekspres ticket over the counter, you will have to pay the full fare of RM55.00 for a single trip or RM100.00 for a return trip ticket. Obviously, return ticket is more worthwhile if you plan the use KLIA Ekspres for round trip. You can save RM10.00 by buying the return ticket. Yes, you will get a 10% discount instantly if you buy the ERL KLIA Ekspres ticket using the self-service kiosk at KLIA Express station at KLIA, KLIA2 and KL Sentral instead of over the counter. Better still, if you are using Master Card (credit or debit card), you can enjoy 20% discount for your KLIA Express tickets, which means a single trip ticket will only cost RM44.00 while a return trip will only cost RM80.00 (or RM40.00 one way). However, according to the KLIA Ekspres website, this 20% discount promotion is only offered for the first 15,000 tickets or until 30 June 2016 whichever come first. Other than the self-service kiosk, you can also enjoy the same 10% discount for your ERL tickets when you make the booking through KLIA Ekspres official website at KLIAEKSPRES.com. You can also enjoy a 20% discount by using your Master Card to make payment when buying your ticket through the website. With this discount, you can safe RM11 per person for a single trip and RM30.00 person for return trip ticket. This 20% promotion is also limited to the first 15,000 tickets or until 30 June 2016 whichever comes first. 10% Discount for Purchase of KLIA Ekspres Ticket through Mobile App (Android or IOS). If you have a smart phone, you can download KLIA Ekspres Mobile App from Google Play or Apple Store and purchase the express train ticket using the mobile app. The good thing about buying the ticket using mobile app is that you are also eligible for the 10% discount. Master Card users can enjoy a 20% discount while promotion last (first 15,000 tickets or until 30 June 2016 whichever comes first). For those who have a Touch 'n GO card, you will automatically enjoy 10% discount when you use your Touch 'n GO card at the gate of KLIA Ekspres train station. This discount is valid from 1 January 2016 to 31 January 2016. From now until 31 March 2016, AmBank/AmBank Islamic/MBF Cards Credit owners can enjoy 20% cashback on their credit card spend for puchase of KLIA Express tickets at original price. Make sure that you take advantage of this special deal if you take KLIA Express during the promotion period. In short, no discount if you buy a single trip ticket over the counter but you can safe RM10.00 if you buy return tickets. IN GENERAL, YOU CAN ALWAYS GET 10% DISCOUNT FOR YOUR KLIA EKSPRES TICKET. If you want to enjoy a 10% discount, simply buy your tickets through either KLIA Ekspres Website, Mobile App or the Self-service Kiosks available at KLIA, KLIA2 or KL Sentral, From time to time, you can also special deals or promotions in collaboration with banks and credit card companies which offer up to 20% discount or cashback. 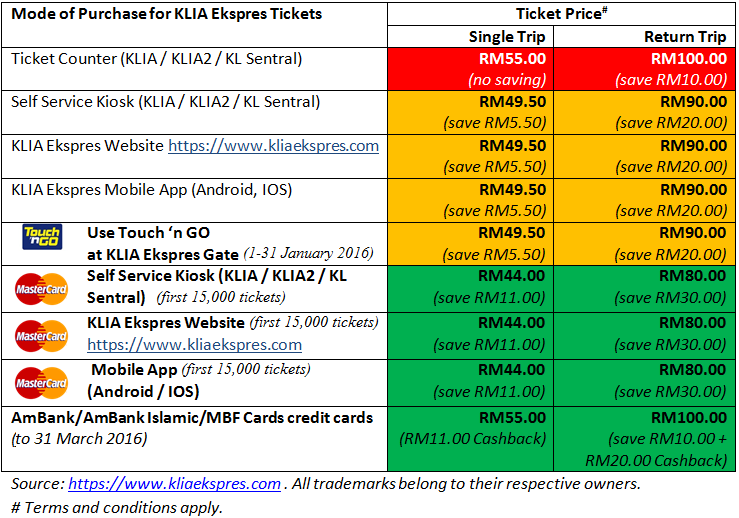 So make sure you check for the best discount deal before buying your KLIA Express tickets. 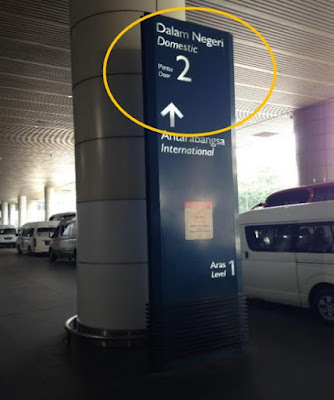 For those who are not in a hurry and have a few people in company, you can also consider using the Taxi service between KLIA and KL Sentral which only cost only about RM74.30. This is cheaper than KLIA Ekspres ticket if share between two passengers or more.